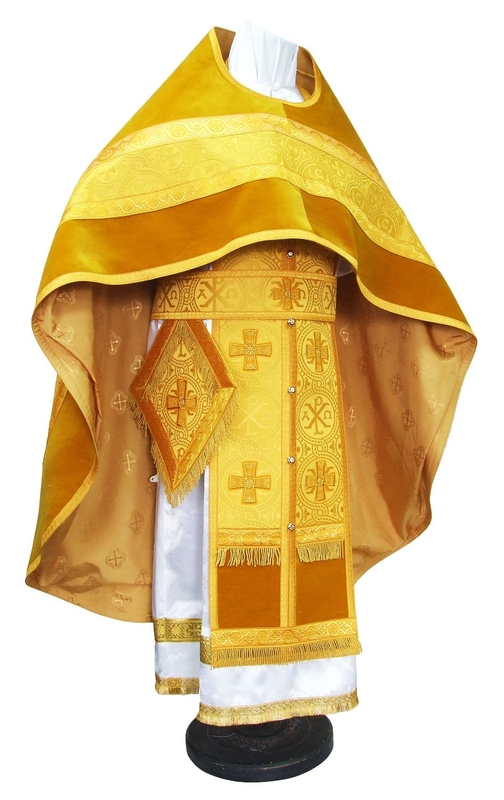 Orthodox Church liturgical Russian Priest clergy vestments (yellow-gold) by Istok Church Supplies Corp.
Istok Church Supplies offers the highest quality made to measure Russian Priest vestments yellow-gold. 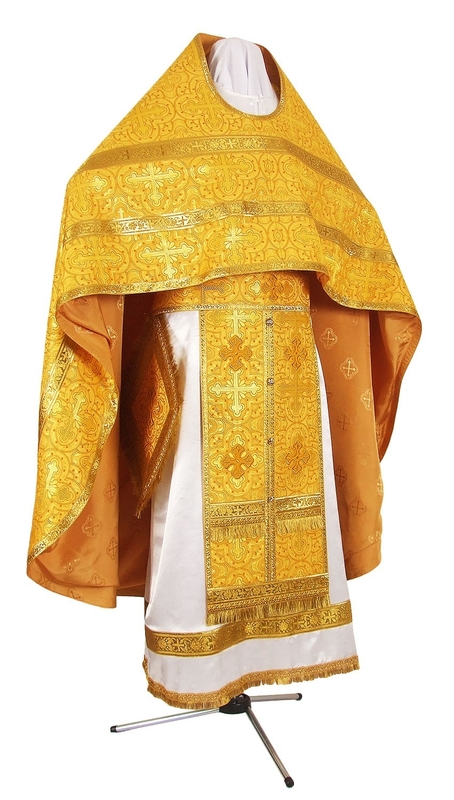 Featuring authentic designs and marvelous motifs, these bright and resplendent Priest vestments are sure to enhance the standing of any Russian Orthodox Christian Priest and church. 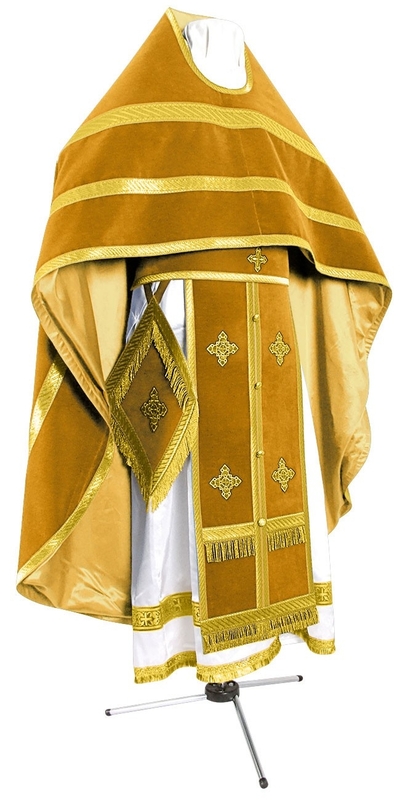 With our decades old experience in serving Orthodox Christian communities, we have acquired expertise to offer beautiful ecclesiastical vestments at competitive prices. 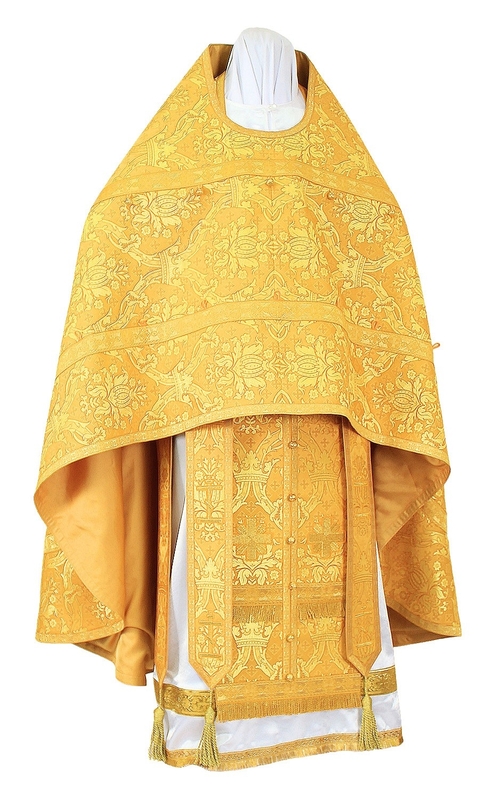 Because of their majestic appearance, our Russian Priest vestments yellow-gold are ideal for highlighting feasts and days honoring Our Lord Jesus Christ, Apostles and Hierarchs, this color is a default one for regular Sunday services outside of lenten periods. 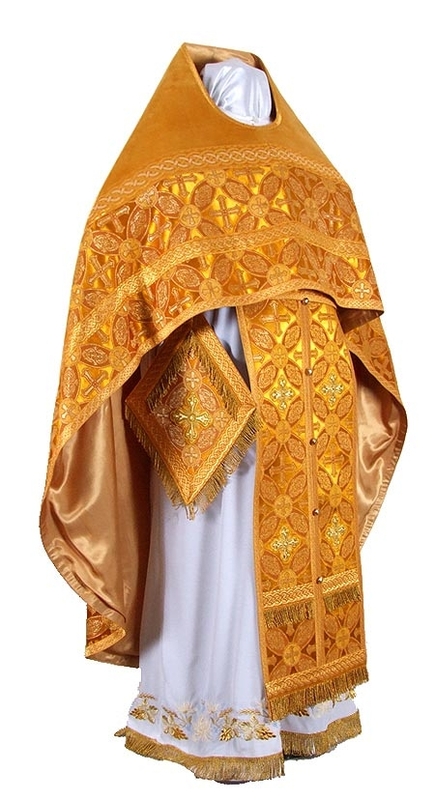 Vestments are fashioned from beautiful ecclesiastical fabrics such as rayon jacquard brocade, metallic jacquard brocade, natural German velvet and beautiful, embroidered fabric. We provide natural rayon lining free of cost to enhance comfort and ease of use. 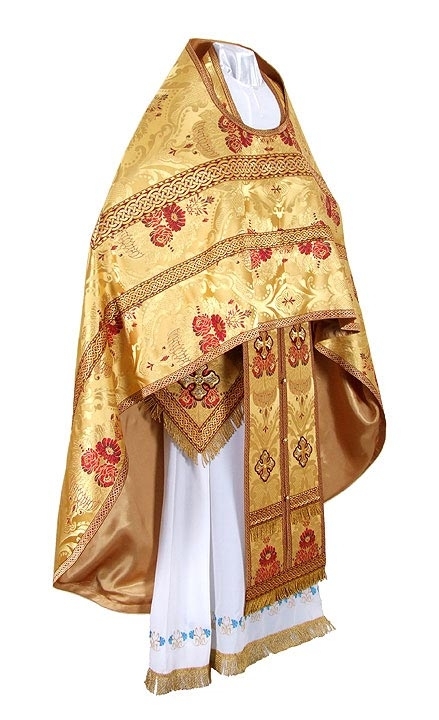 Fabrics are divided into various classes and customers who wish to purchase a particular vestment in a different fabric belonging to the same class as the one featured can do so during check out process. 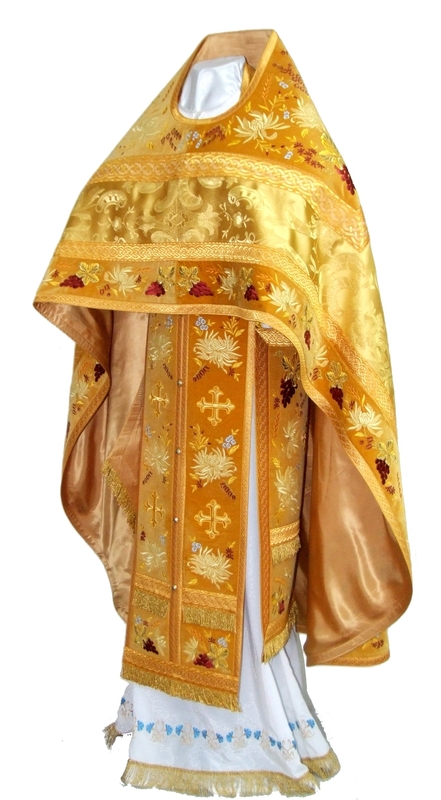 To upgrade orders, customers can add natural velvet inserts, matching chalice covers and an embroidered icon for the back. Customers can choose from three types of adornments – standard, premier and luxury. Adornments include galloons and crosses – customers can decide according to their requirements and budgets. 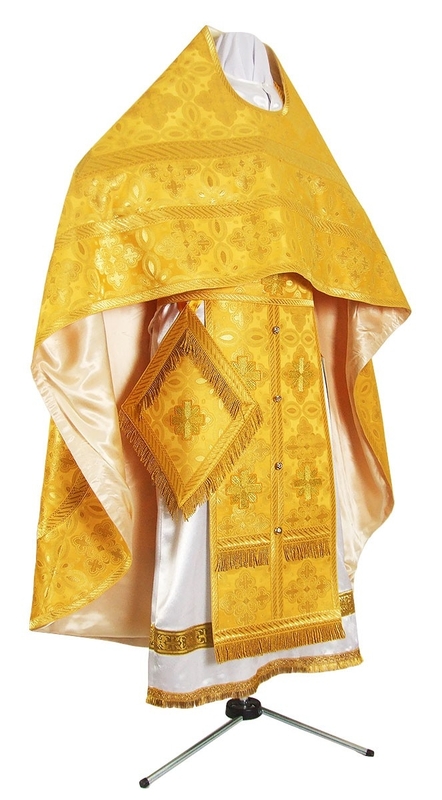 We offer Russian Priest vestments yellow-gold as complete sets so customers don’t need to look for individual items. Each set comprises six articles – zone, epimanika, epitralhilion, epigonation, nabedrennik and phelonion. 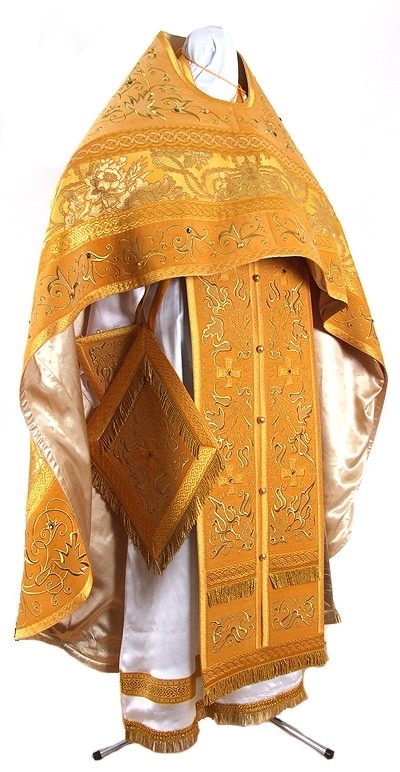 We are renowned the world over for our made to measure Orthodox Christian vestments. 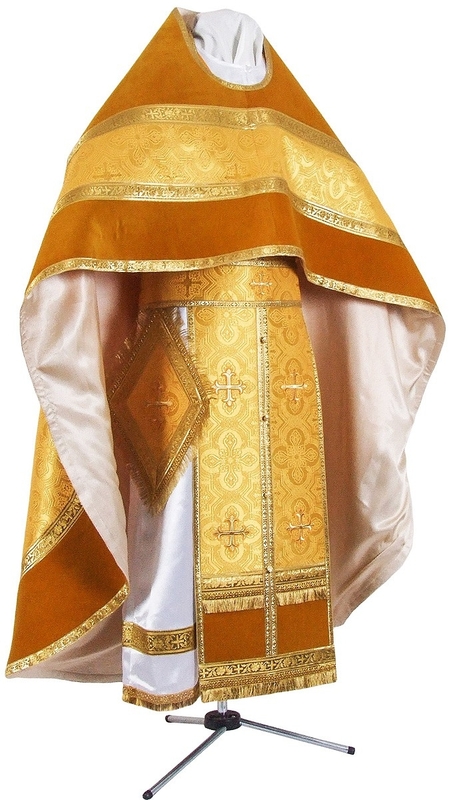 Each order is carefully executed by our experienced tailors in Europe. We take a few shorts weeks to execute and ship individual orders but we are sure customers will be pleased with the end results. We request you to provide us with precise measurements according to our online measurement chart so we can commence work at the earliest. 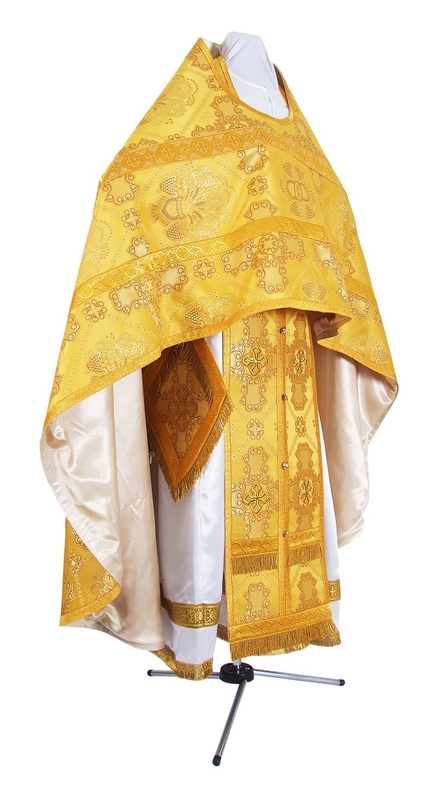 Browse through our extensive collection to find beautiful Russian Priest vestments that will set you apart! Thank You very much for the excellent work we always receive! Thank you and congratulations for the quality of work.